A leading University College specialising in art, design, media and performance education, Spaceist undertook a project in collaboration with Lee Fitzgerald Architects for the Arts University at Bournemouth. The main challange was working with the spatial limitations and to supply a furniture package for a high capacity volume of users within the confinements of space available. We were able to work with the architects to provide our thorough insight on educational projects to formulate a suitable result. For the project, two distinct areas were created; one featuring soft seating for recreation and informal encounters and the other for dining and study. 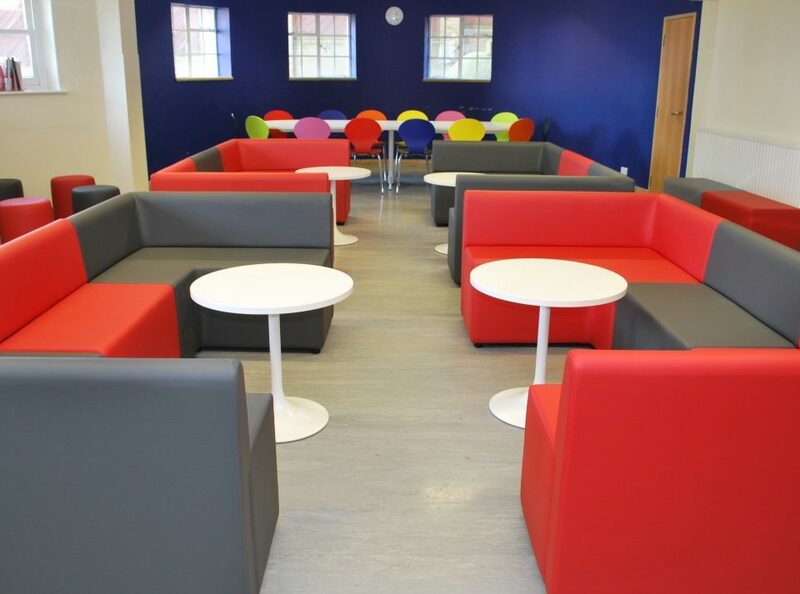 Our robust and high quality choice for the soft seating areas was made from the Modular Cube range. The versatility of the Modular Cubes was especially vital for this project as the limitations on space meant it required a very thoughtful furniture selection to create adequate seating without overcrowding the space. Selected in 82cm units and 42cm square corner units, the elements were arranged in various formations enhancing the seating zone with comfortable and highly robust modular cubes. 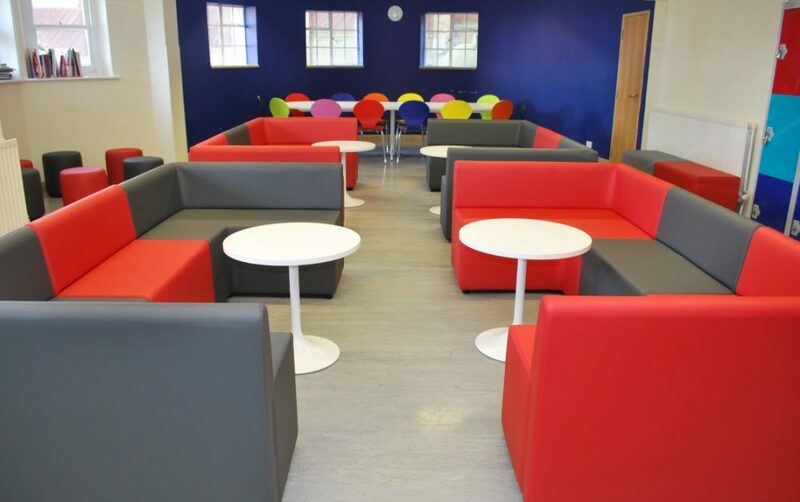 The selection of colours creates further bright and contrast shades adding to the inviting and warm look of the space for the students. 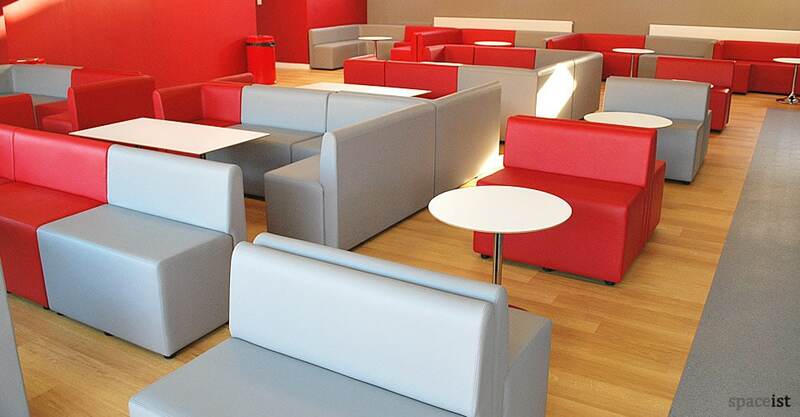 The square corner element means the modular seats can be formed into various u-shapes. 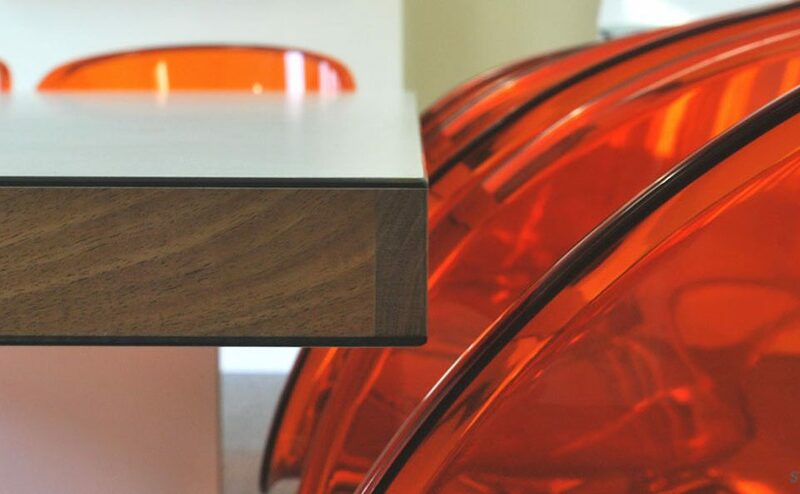 In the centre of some sofas, we have supplied the Trumpet table to offer support. 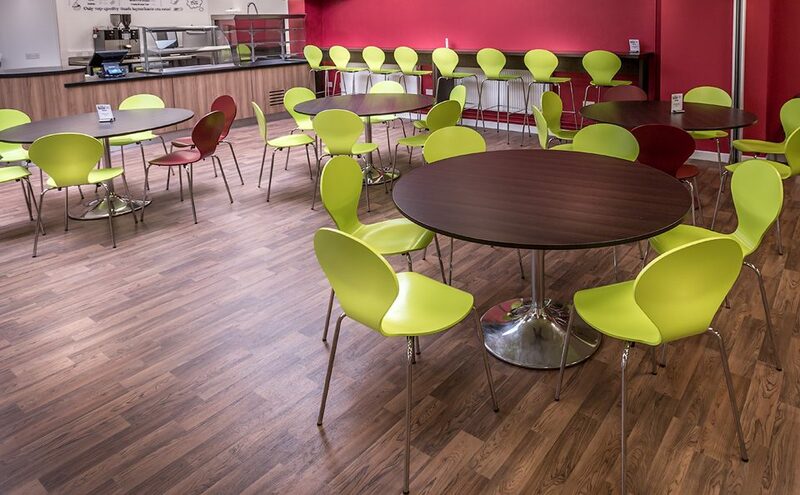 We supplied the Trumpet table with a contrast white laminate top to match the further table surfaces within the soft seating side of the room. This contract specific table presents a sturdy composition that supports use within a high volume use interiors. The trumpet style chrome base offers sufficient support and with a multiple size option, it has been possible to use the exact size for the particular space that was required. The selection made for the study and dining spaces comes from the JB Waldo canteen benches, as it offers the best support with extremely tough table composition. 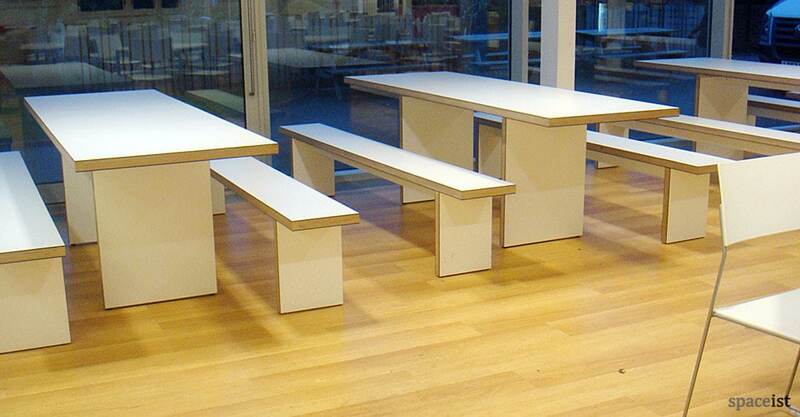 The practical shape allows maximisation of the space whilst creating a smart and neat looking dining areas. 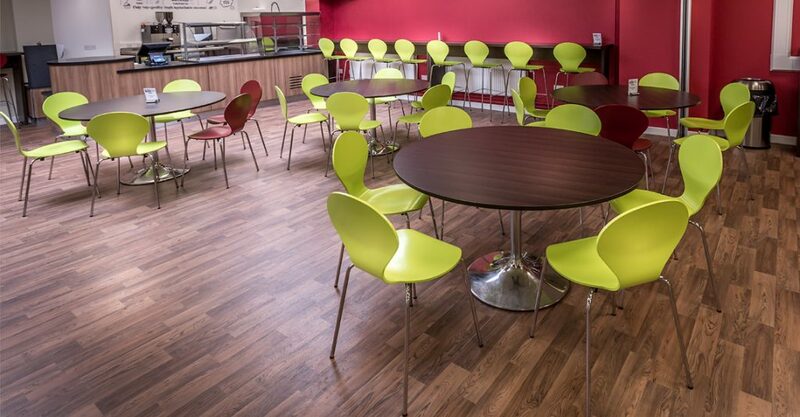 A wide selection of laminate colours are available, making it possible to match the colour tones with specific interior colour palettes. We supplied the tables in a stark white to off set the contrasting red and beige modular cubes. 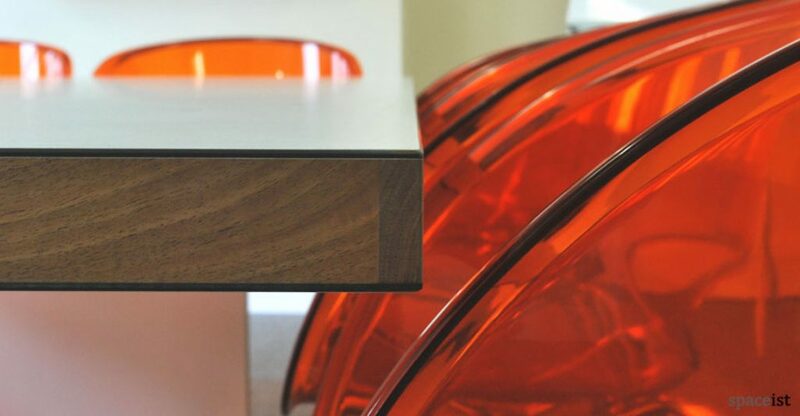 The lightweight tables and benches are convenient and easy to rearrange if required. The final result was a practical and efficient use of the space supported by a well thought out selection of furnishings and layout choices.